The first strikes for the May 4 Kentucky Derby can now be revealed. Back in 1999, I developed my Derby Strikes System. The system consists of nine key factors. When a horse does not qualify in one of the nine categories, the horse gets a strike. The nine key factors (or categories) are explained at the end of this column. Various “rules” for the Kentucky Derby once were quite popular. A “Derby rule” meant a horse needed to have done this or that, or not done this or that, in order to win the race. However, through the years, as many of the “Derby rules” were broken, their popularity seemed to wane. As I previously have written, I think what quite possibly makes my Derby Strikes System better than any single “Derby rule” is the strikes system is more comprehensive. The Derby Strikes System is an amalgamation of factors that attempts to ascertain the chances a horse has to win the Kentucky Derby from both tactical and historical perspectives. It is the marriage of the TACTICAL with the HISTORICAL that I think distinguishes the strikes system from any “Derby rule,” per se. Many years after I came up with my Derby Strikes System in 1999, racing enthusiast Ryan Stillman suggested that I research how many strikes each Kentucky Derby winner had prior to 1999. I realized that Stillman had a good idea, though I could not go back any further than 1973 because stakes races in the United States were first graded in 1973. Two of my nine key factors deal with graded stakes races. According to the Derby Strikes System, a horse with zero strikes or only one strike has a much better chance to win the Kentucky Derby than a horse with two strikes. Going back to 1973, 38 of the last 46 Kentucky Derby winners have had zero strikes or just one strike. According to the Derby Strikes System, it is a tall task for a horse with more than two strikes to win the Kentucky Derby. Of the last 46 horses to win the Run for the Roses, only two horses have won with more than two strikes, Mine That Bird and Justify. Mine That Bird pulled off a 50-1 shocker when he won the 2009 Kentucky Derby. Justify proved a punctual 5-2 favorite in the 2018 edition. While there was a huge disparity in the odds for Mine That Bird and Justify, they did have something in common. The track was sloppy when they won the roses. Was the sloppy track a contributing factor when Mine That Bird and Justify succeeded despite having more than two strikes? Maybe, or maybe not. Who really knows? I do know that even though the Derby Strikes System is important to me when trying to determine a horse’s chances to win the Kentucky Derby, Justify’s three strikes did not keep me from picking him to win last year’s renewal. Prior to the 2018 Kentucky Derby, I wrote: “Justify had stardom written all over him from the moment he took his first step out of the gate in his career debut. He has yet to taste defeat. And Justify is my pick to win this year’s Kentucky Derby. I am picking Justify even though he didn’t race at 2, even though he has just three career starts and even though he has three strikes in my Derby Strikes System. Justify not only won the Kentucky Derby, he subsequently took the Preakness Stakes and Belmont Stakes to become this country’s 13th Triple Crown winner. After the Belmont, Justify was retired to stud with six victories from six lifetime starts. Justify managed to break the so-called Apollo jinx. Every Kentucky Derby winner since Apollo in 1882 had raced at 2 until Justify last year. A horse needs to have raced as a 2-year-old to avoid getting a strike in Category 8. Justify became the first horse to win the Kentucky Derby despite a strike in Category 8. By My Standards, coming off a maiden victory, won the Grade II Louisiana Derby by three-quarters of a length in a 22-1 upset at that venerable New Orleans venue last Saturday while making his fifth career start. Trained by Bret Calhoun, By My Standards completed 1 1/8 miles in a hand-timed 1:49.53. The Kentucky-bred Goldencents colt was credited with a career-best 97 Beyer Speed Figure. Spinoff finished second at 4-1. Sueno ended up third at 7-1 in the field of 11, five lengths behind Spinoff. War of Will, the 4-5 favorite, broke alertly before he abruptly lost his footing behind in the first few strides. He wound up ninth after having won all three of his previous starts on dirt for trainer Mark Casse. On Steve Byk’s radio program At the Races, Casse said Tuesday morning he was “very optimistic” regarding War of Will’s situation. Casse said the colt would be shipped to Kentucky and checked out thoroughly there. If all does check out well, the colt could go back to the track to train at Keeneland on Friday, Casse added. A horse’s number of strikes can’t be determined until the horse’s next race will be the Kentucky Derby. Louisiana Derby participants By My Standards, Spinoff and War of Will are not scheduled to start again before the May 4 classic, which means their strikes now can be tallied. By My Standards has only one strike. And as is the case with so many horses these days, he gets a strike in Category 6, the “sufficient racing experience category.” I have noted in recent years that I consider this to be by far the least important category because horses just do not race as much nowadays as they did when I introduced Derby Strikes System in 1999. From 1973 through 2000, Fusaichi Pegasus was the only horse to get a strike in Category 6. He had made five starts going into the Kentucky Derby. But from 2001 through 2018, seven horses — Barbaro, Big Brown, Animal Kingdom, I’ll Have Another, American Pharoah, Always Dreaming and Justify — got a strike in Category 6 for making fewer than six starts before the Kentucky Derby. Ever since Animal Kingdom in 2011, I decided that a Category 6 strike in itself will not stop me from picking a horse to win the Kentucky Derby. I picked I’ll Have Another in 2012, American Pharoah in 2015 and Justify in 2018 even though they each got a strike in Category 6. And while Justify’s three strikes did worry me to some extent, the fact that one of his strikes came in Category 6 made it much easier for me to go ahead and pick him. As for the only other horse in the last 46 years to win the Kentucky Derby with more than two strikes, Mine That Bird was fine in the not-so-important-anymore Category 6. All four of his strikes came in what I consider to be more meaningful categories. Spinoff, like Justify, has three strikes. One of his strikes is in Category 6. He also gets a strike in Category 2 for not having won a graded stakes race. And he gets a third strike in Category 4 because he was in front with a furlong to go in the Louisiana Derby before finishing second. If War of Will is able to get over his physical setback and does run in the Kentucky Derby, at least he will be in good shape concerning his number of strikes. War of Will has just one strike. With eight lifetime starts, he is okay in Category 6, unlike By My Standards and Spinoff. War of Will’s only strike comes in Category 5 for not having finished at least third in a 1 1/8-mile race or longer. Todd Pletcher trains Spinoff. Pletcher also conditions Cutting Humor, victorious by a neck at 2-1 in last Sunday’s Grade III Sunland Derby at Sunland Park Racetrack & Casino. Anothertwistafate ran second in a fine try at 7-2. Mucho Gusto, who set a fast pace as the 9-10 favorite, finished third in the field of nine, nearly six lengths behind Anothertwistafate. Mucho Gusto was responsible for fractions of :22.76, :45.63 and 1:09.63. It is likely that Mucho Gusto especially paid the price for that scorching half-mile in :45.63. Cutting Humor’s final time in the 1 1/8-mile Sunland Derby was a sparkling 1:46.94 to break the track record of 1:47.21 established by Oh So Regal when he won the 2018 Sunland Park Handicap at the age of 4. It does seem that this year’s Sunland Derby was contested on a lightning-fast strip. Earlier on the card, the Southern California-based mare Escape Clause also broke a track record when she stepped one mile in 1:34.00 to win the Harry Henson Handicap by a little more than seven lengths. Before Mine That Bird captured the Kentucky Derby, he finished fourth in Kelly Leak’s 2009 Sunland Derby, which was run in 1:50.02. Mine That Bird recorded an 80 Beyer Speed Figure in the Sunland Derby before posting a 105 in the Kentucky Derby. More recently, Firing Line won the 2015 Sunland Derby by 14 1/4 lengths in 1:47.39 when he produced a 103 Beyer Speed Figure. Firing Line then ran second in the Kentucky Derby, a length behind American Pharoah, who would go on to sweep the Triple Crown. Firing Line’s Kentucky Derby figure was 104. Cutting Humor recorded a career-best 95 Beyer Speed Figure for his Sunland Derby triumph. In terms of strikes, Cutting Humor has zero. If Anothertwistafate and/or Mucho Gusto start next in the Kentucky Derby, they will do so with two strikes apiece. Blaine Wright trains Anothertwistafate, who currently has 30 points for the Kentucky Derby. Because 30 points might not be sufficient to get into the Kentucky Derby field, there is a chance that Anothertwistafate will race again before May 4 in order to try and earn more points. 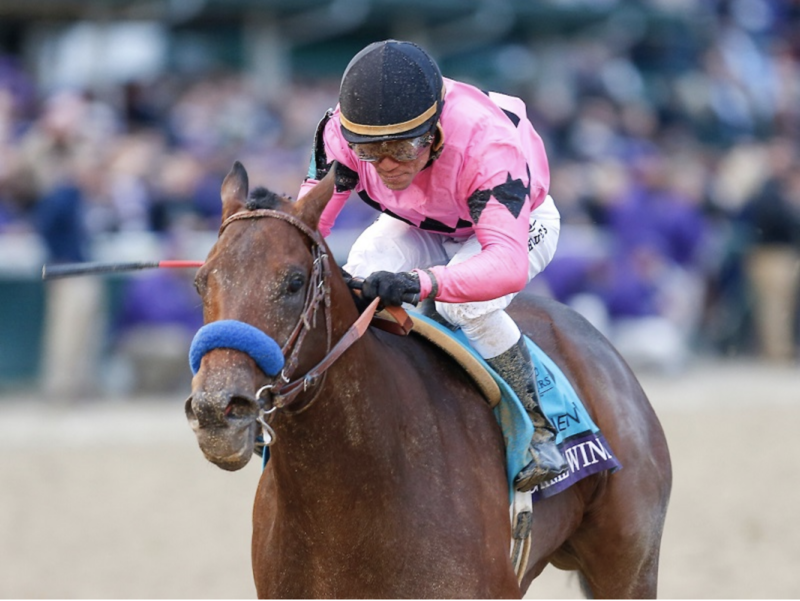 If Anothertwistafate does run in the Kentucky Derby without another start before May 4, one of his two strikes would come in Category 2 for not having won a graded stakes race. He also would get a strike in — you guessed it — Category 6 for having made only five career starts. But if Anothertwistafate does race again before May 4, it would give him six career starts, eliminating his strike in Category 6. Mucho Gusto now seems iffy for the Kentucky Derby. If he were to make his next start there, one of his two strikes would come in Category 4 for being second with a furlong left to run in the Sunland Derby before he finished third. And he would get another strike in Category 6 because he’s made just five career starts. Anothertwistafate, Cutting Humor and By My Standards are newcomers on my Top 10 this week. Even though Casse said he feels optimistic War of Will can still make the Kentucky Derby, I elected to drop the colt from my Top 10 this week and will monitor his situation going forward. He was No. 4 last week. Mucho Gusto and Instagrand also exit my Top 10 this week. Mucho Gusto was No. 7 last week before his loss in the Sunland Derby. Hall of Fame trainer Jerry Hollendorfer told Daily Racing Form’s Jay Privman that the “plan as of the moment” for Instagrand is to run him in the Grade I Santa Anita Derby on April 6. A good performance there probably would propel Instagrand back onto my Top 10. The Kentucky-bred Into Mischief colt ran third in Aqueduct’s Grade III Gotham Stakes on March 9 while making his first start since a 10 1/4-length victory in Del Mar’s Grade II Best Pal Stakes last Aug. 11. No. 4 Code of Honor and No. 8 Bourbon War are among 11 entered in Gulfstream Park’s Grade I Xpressbet.com Florida Derby this Saturday. The 1 1/8-mile race offers 170 qualifying points (100-40-20-10) for the Kentucky Derby. Hidden Scroll has been installed as the Florida Derby morning-line favorite at 5-2. Code of Honor is 3-1. Bourbon War is 7-2. After a scintillating 14-length debut victory Jan. 26 at Gulfstream, Hidden Scroll was backed down to 6-5 favoritism in the Fountain of Youth. He weakened a bit late after he set a scorching pace. All in all, considering how fast he ran early and it was just his second career start, he certainly didn’t disgrace himself. He gets a rider switch from Joel Rosario to Javier Castellano for the Florida Derby. Australia’s Winx won last Saturday’s Group I George Ryder Stakes at Rosehill in what is scheduled to be the penultimate start of the mare’s fantastic career. It extended her extraordinary winning streak to 32. This year’s George Ryder was Winx’s 24th Group/Grade I victory, a world record. The 22 such wins by the Irish hurdler Hurricane Fly in Europe from 2008-15 had stood as the world record until Winx came along. America’s legendary gelding John Henry ranks third in terms of all-time Group/Grade I wins with 16. Winx is scheduled to race for the final time in the Group I Queen Elizabeth Stakes at Randwick on April 13.